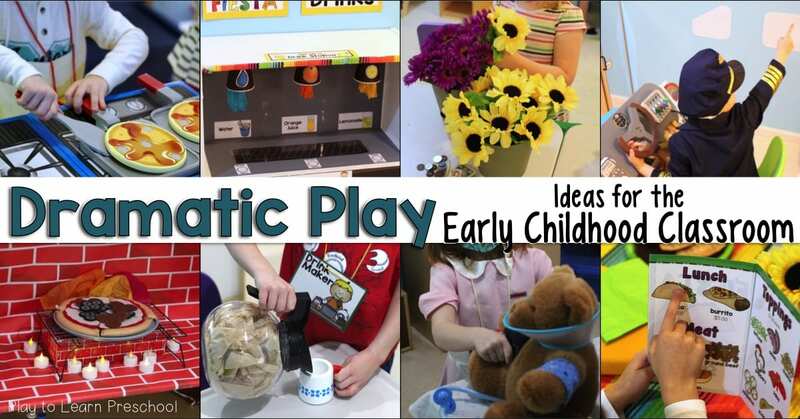 You might know that we really, really, love the Dramatic Play center. By changing it regularly from the basic Home Living center to other scenarios we give our students the opportunity to take on different roles. 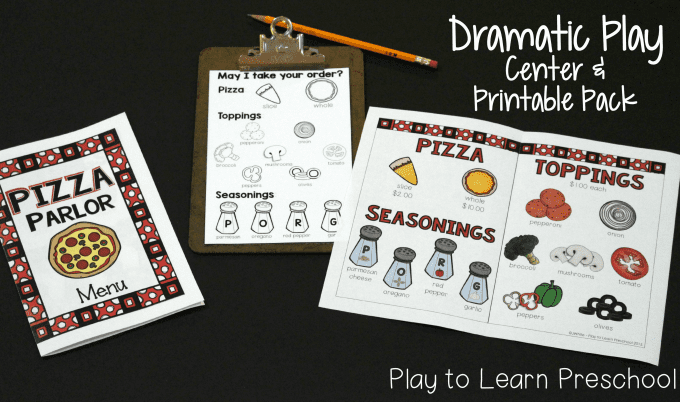 Since it’s the beginning of the year and we are just exiting survival mode and moving toward real playing and learning, we wanted to set the dramatic play center up as something fun and very familiar to the students… this Pizza Parlor is perfect! 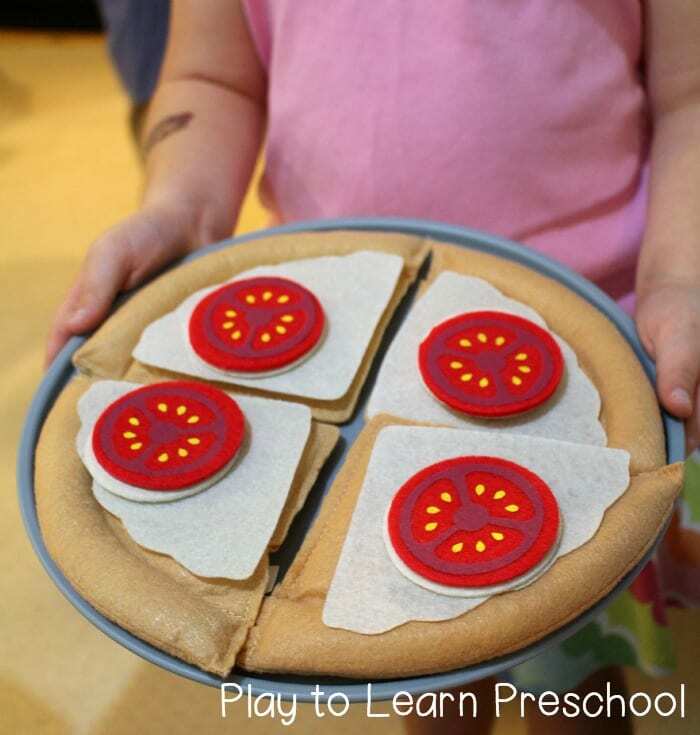 We bought 2 new “props” to use in this center: a Felt Food Pizza Set from Melissa & Doug and the corresponding Pizza Seasoning Set. 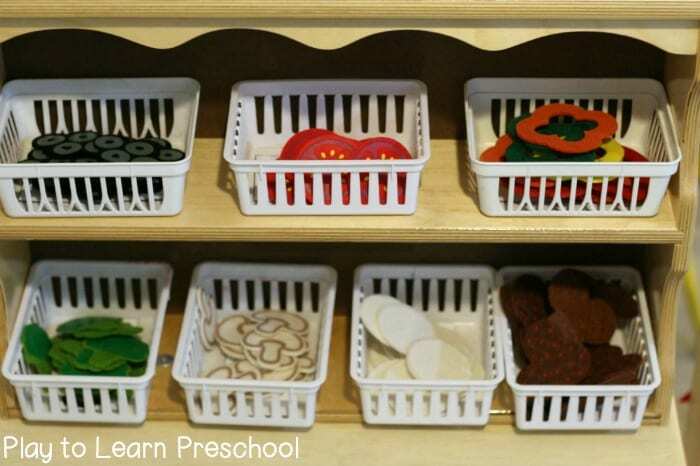 I love everything Melissa & Doug make and this might be my very favorite. 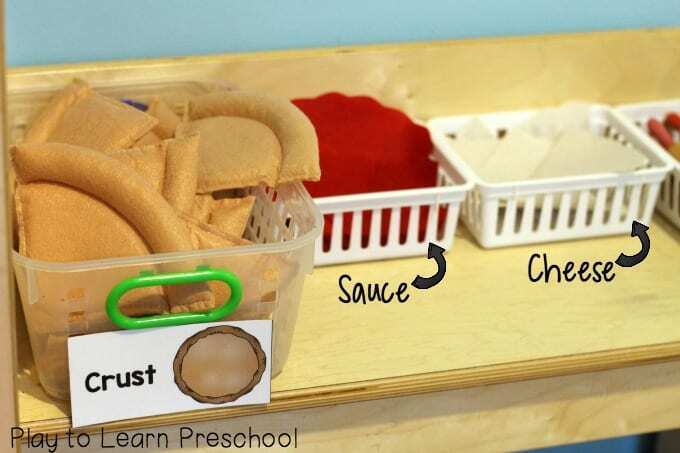 The pizza pieces, pan and box are sturdy and colorful. The seasonings have a picture label, and the sprinkles on the inside match the colors of the real seasonings. Love. 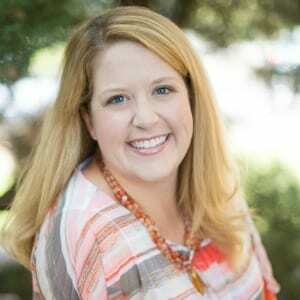 This post includes affiliate links to the products that we used and loved. We always add a sign on our main dramatic play wall. 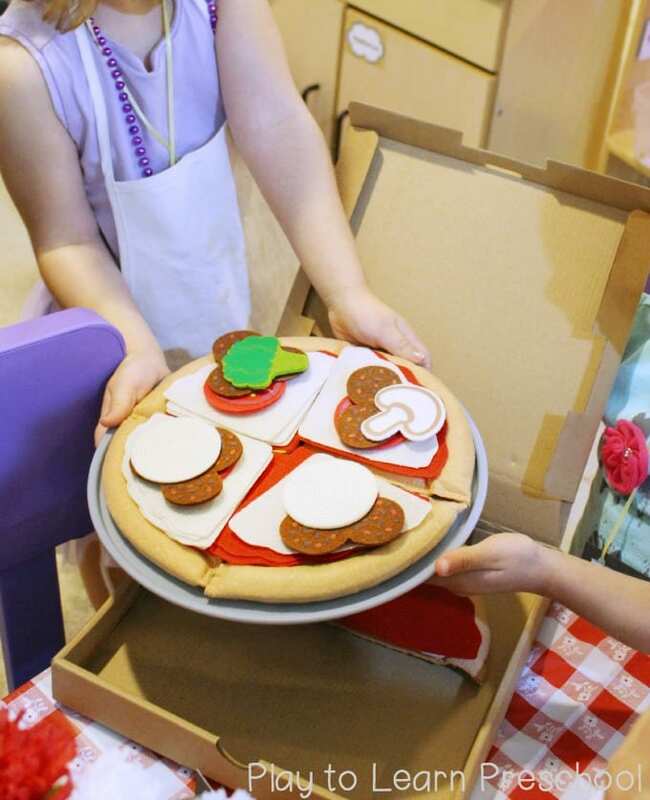 In this case, we’d like to welcome you to our “Pizzeria”!! 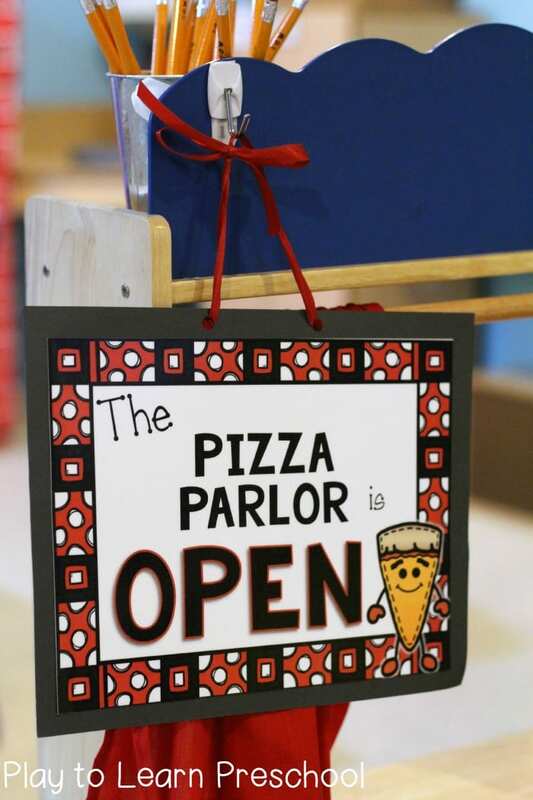 At the hostess station, which is really our puppet theatre, the sign tells whether the Pizza Parlor is open or closed. Even our youngest students learn to “read” this sign! 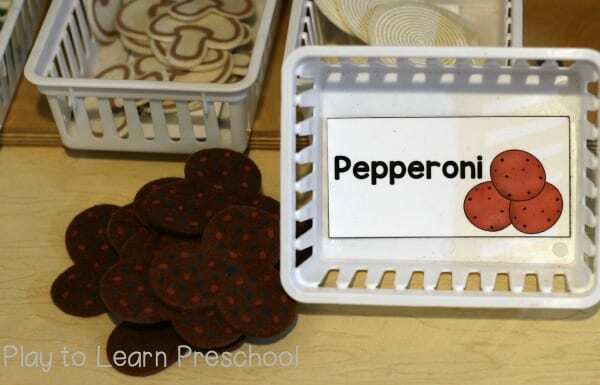 By the middle of the year, they will not play in the center unless someone turns the sign to “Open.” It’s so cute, and helps to teach our youngest learners that print has meaning. So smart! The pizza parlor is now open. Are you getting hungry? 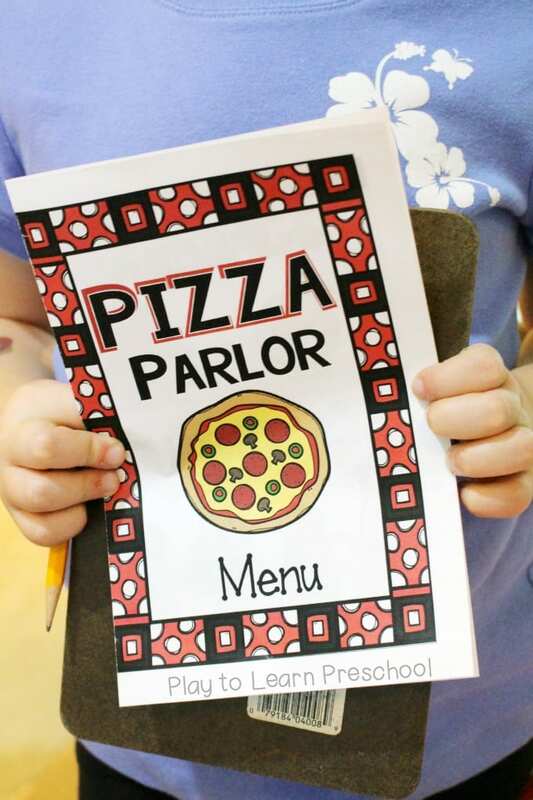 First, we need Pizza Parlor employees to keep things running smoothly. Would you like to be the waitress or the chef today?! Just here for the pizza, and not to work? No problem. The employees will show you to your table. How many people are in your party, and would you like to look at a menu? Table #2 has seating for 4 people. These silk flowers and flickering (LED no-flame) candles create a fancy dining atmosphere. We hope you’re hungry! Would you like to order a slice of pizza or the whole pie? Which toppings and seasonings would you like on it? Back in the kitchen, the chefs can get to work on your pizza order. This counter has all of our pizza crusts, homemade tomato sauce and fresh mozzarella cheese. 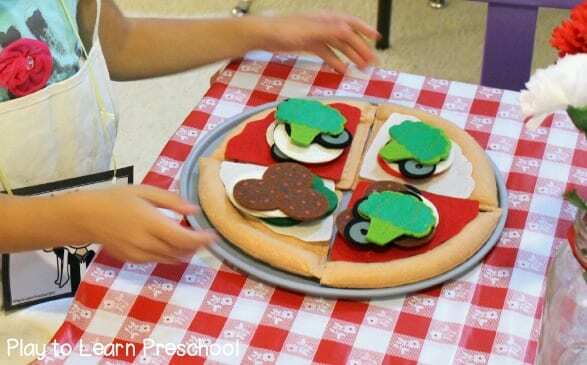 The pizza parlor also offers a variety of healthy toppings, including olives, tomatoes, peppers, broccoli and mushrooms. What do you like on your pizza? All of the toppings are labeled so that kitchen staff can find what they need and return it to the correct place for the next pizza order. 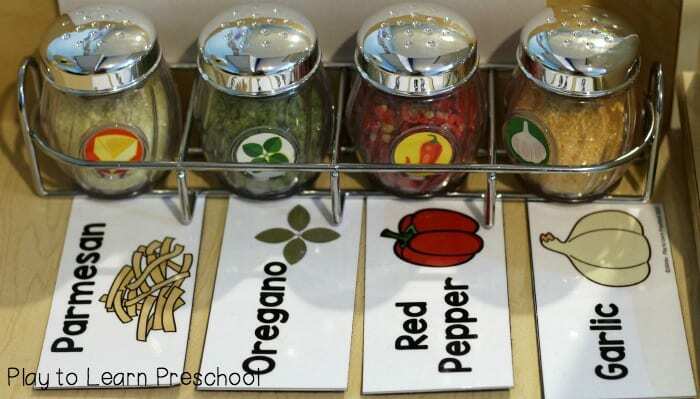 We also offer a variety of delicious seasonings to sprinkle onto your pizza. Would you like some Oregano or Parmesan cheese? When the pizza is made, it’s time to cook it in our special brick oven. 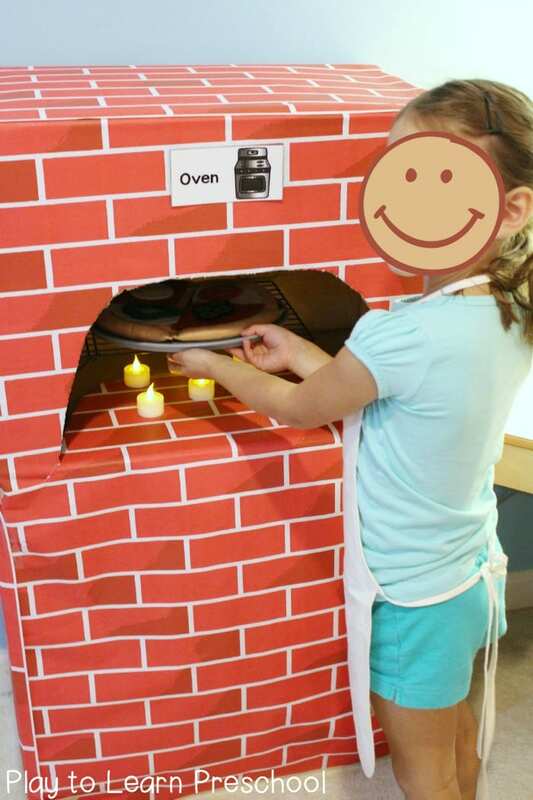 Each morning when the pizza parlor opens, we “light” the oven (with these little LED tealight candles). There is also a baking rack in there so that the pizza pan doesn’t get too close to the flames. Ouch! This little chef forgot her oven mitts. Your pizza is ready! How would you like a tomato and onion pizza with no sauce? Or maybe you’d prefer a broccoli, olive, onion, pepperoni pizza with a sauce-cheese pattern?! 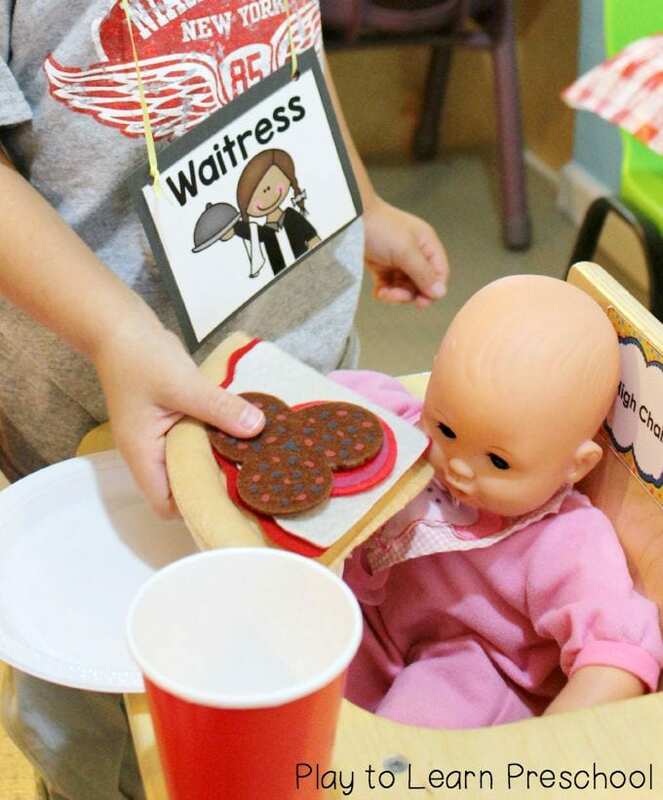 Our helpful waiters and waitresses will even feed your baby. Babies love pepperoni tomato pizza, right? If you’re in a hurry, we can even box up your pizza to go at no extra charge! Better yet, call in your order and one of our drivers will deliver the pizza to your door. Honestly, it does not get any better than this! The students were all so enthusiastic and engaged in this center. 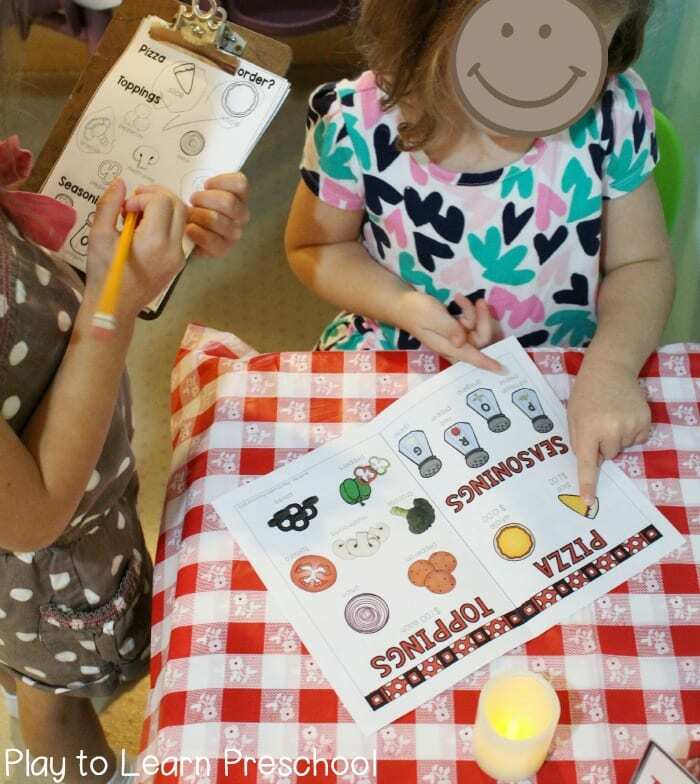 They practiced their reading skills with the picture menus, and their writing skills with the order forms. They worked on verbal skills by answering the phone and waiting on customers. 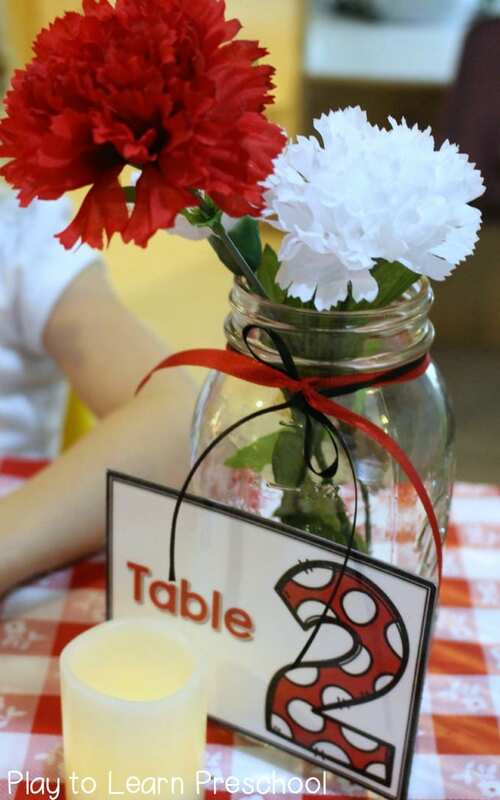 We even practiced our restaurant manners. 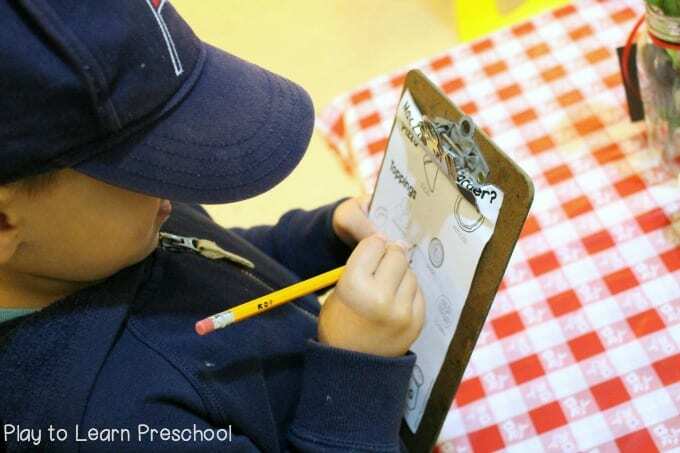 It was the perfect introduction to different dramatic play scenarios that we will have at preschool this year. 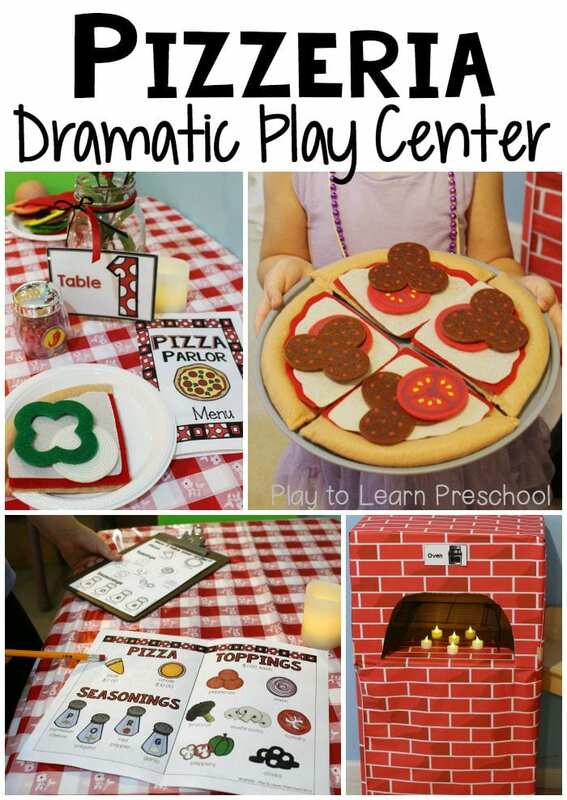 Click below to get your own Pizza Parlor Dramatic Play set. 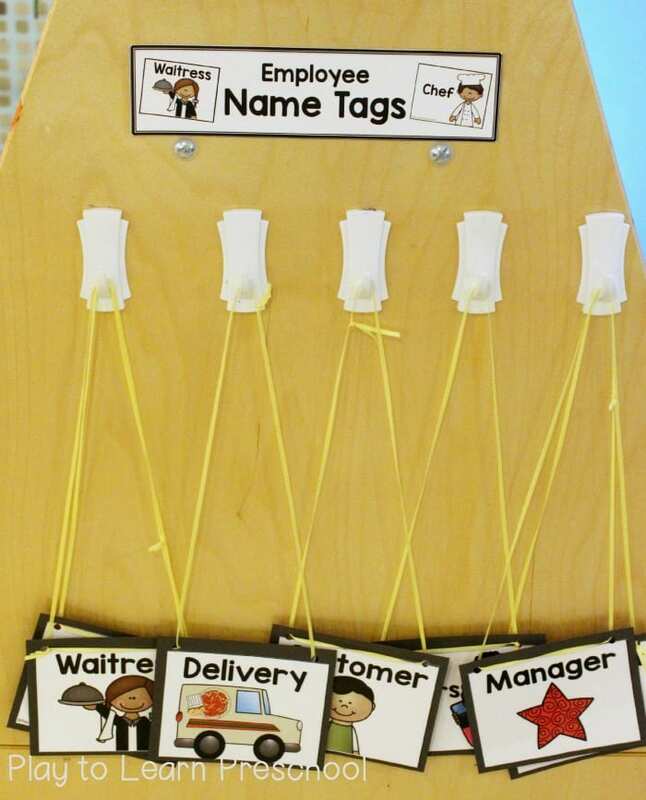 It includes the menu, order forms, all of the labels, the job name tags and more! I have been in such anticipation for this printable to come out! It is perfect for my group 🙂 Thank you for all your hard work!